What time do you get up in the morning? What time to you eat dinner? Thinking about your daily routine is a great way to practice time! Kids draw hands on the clocks to show the time they get up in the morning, eat breakfast, and more. 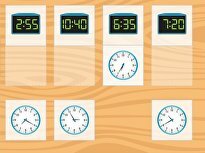 Telling time on an analog clock can be tricky business for young learners. 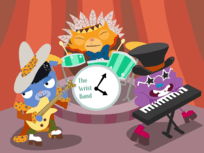 This guided lesson on time helps second graders improve their ability to tell time to the hour, half-hour and quarter hour. Targeted instruction and practical exercises give kids the practice they need to master this important skill. For even more practice opportunities, download and print the time worksheets that correspond to this lesson. Tick-tock, watch the clock! 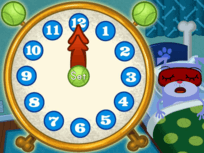 Help your child practice telling time with an analog clock. Kids practice telling time by drawing hands on the clocks to match the times given. 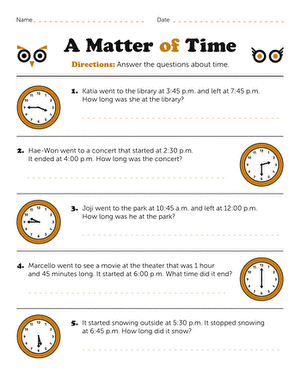 Teach your student about telling time to the quarter hour with this intro worksheet. 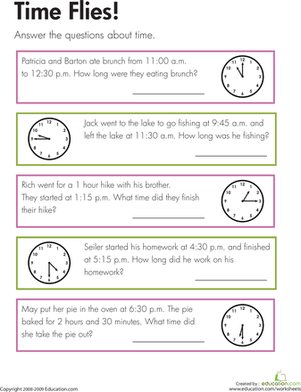 Kids completing this third grade math worksheet tell time to the nearest quarter hour and determine the duration of intervals of time. 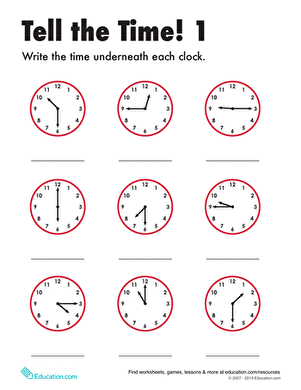 For this second grade math worksheet, kids look at each analog clock, determine the time, and write the time in the space provided. 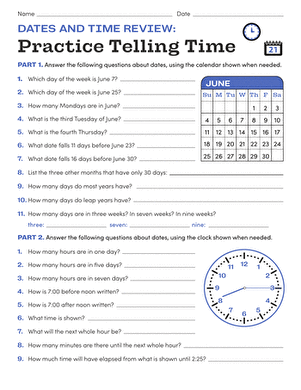 This review sheet is a great way to practice telling time in different ways, from reading a calendar to calculating elapsed time. Time flies in this time telling worksheet, which tasks kids with calculate the amount of time that has passed. Your child can use the pictured clock to solve. How Much Time Has Gone By? Now that your third grader is an expert at telling time, bring on a bigger challenge: calculating elapsed time. Telling Time: On the Hour or Half Hour? 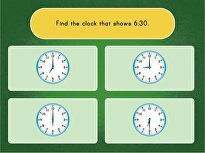 Test your second grader's time telling skills by challenging her to write the time shown on each clock. 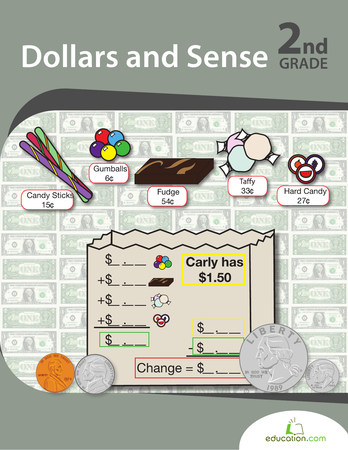 Help your third grader learn the language of money with this worksheet all about money and the words that go with it. Kids practice telling time to five minutes by reading the clocks and writing the time in digital form.